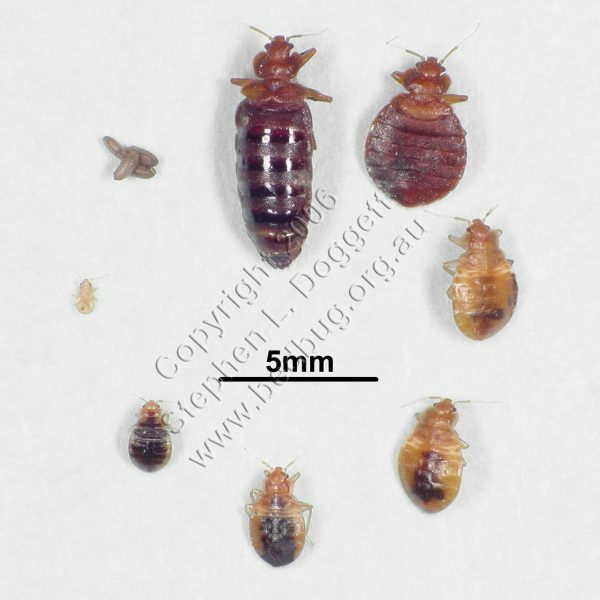 Studies suggest that the common bed bugs (Cimex lectularius) that infest our homes today are descendants of cave dwelling bugs that fed on bats and later on our ancestors. As humans moved out of the caves and into their agricultural civilizations, the bugs moved and evolved with them. Since then we have spread them all over the world. Archeologists have even found fossilized bed bugs dating back 3,500 years. Ever since the establishment of the first American colonies, bed bugs have been a part of American life. 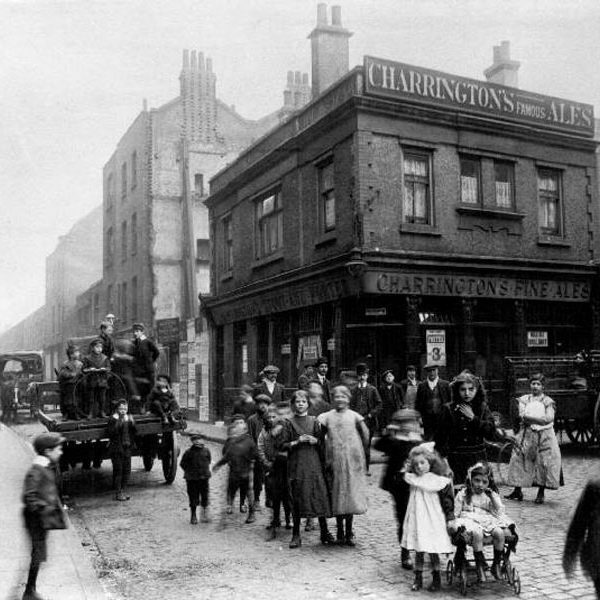 During the early 1900s, the infestations reached their peak causing tremendous problems in hotels and homes throughout the country. Then DDT was introduced in the early 40’s and was used heavily to combat the pests. It was so effective, in fact, that most Americans thought they had completely wiped them out. Boy were they wrong! Since about 2000, bed bugs have had a comeback – and this time they are highly pesticide-resistant. The U.S. National Pest Management Association reports a 71% increase in bed bug calls between 2000 and 2005, and the pests have been found in many areas and countries where they have never existed before. Thanks to DDT and other powerful chemicals they were nearly eliminated from the developed world in the early 1940’s. However, they have been enjoying a steady comeback since the mid 90’s. Bed bugs (Cimex lectularius) are parasitic insects that feed exclusively on blood. They do not fly or jump. 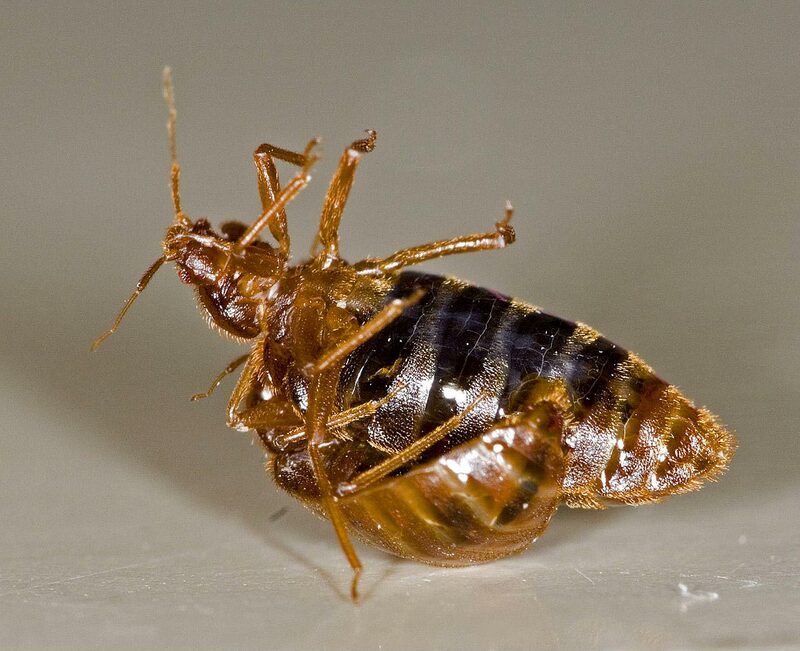 Adult bed bugs are reddish-brown, flattened, oval-shaped and approximately 1/4” in length. They have segmented abdomens that give them a banded appearance. 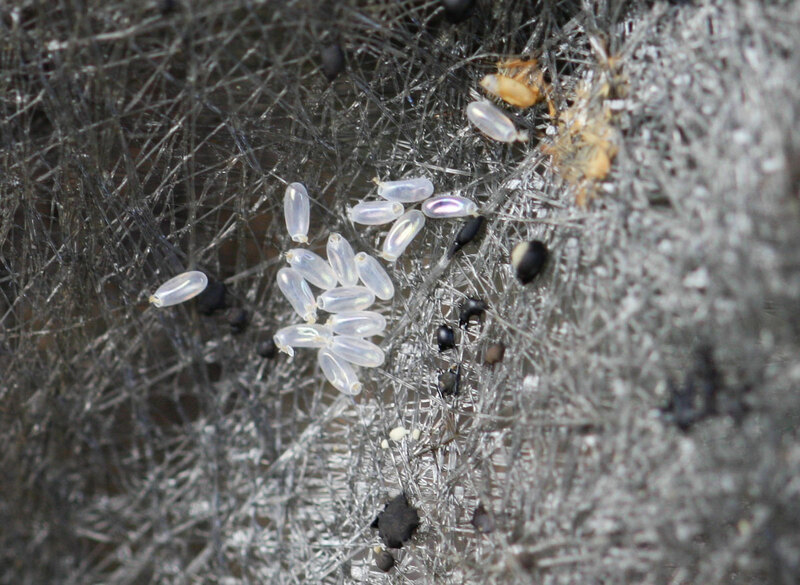 The newly hatched (nymphs) are translucent, tan colored and approximately 1 mm in length. The bed bug goes through five developmental stages before becoming a breeding adult. In each stage the nymph must take a blood meal before shedding (molting) its exoskeleton and growing to the next stage; each step is usually 5-8 days. Under optimal conditions the total developmental process from egg to adult is about 37 days. Adult bed bugs can live 10-18 months and can survive without feeding for many months. Temperature and other environmental conditions play a large role in the longevity and population growth. The common bed bug prefers to feed on human blood but will feed on birds and pets if needed. They are attracted to CO2 and body heat. Once a host is located they feed by piercing the skin with what is called a stylet fascicle. As the skin is pierced they inject saliva into the feeding area which acts as a local anesthetic and anti-coagulant. 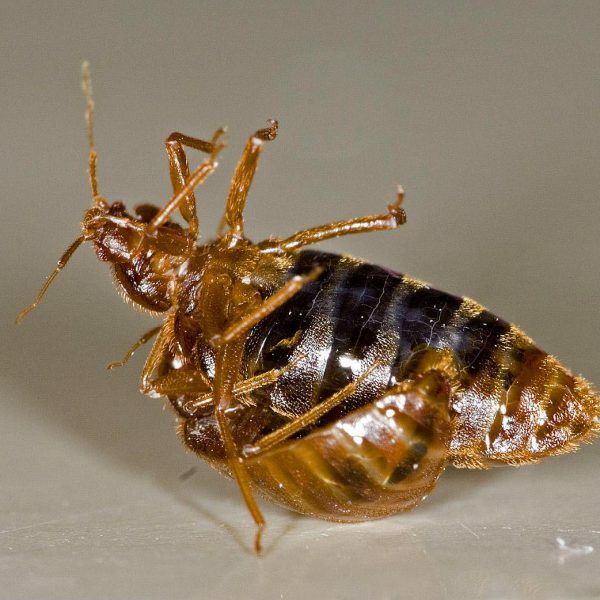 A bed bug may probe the skin several times before feeding, searching for a space that allows the blood to flow rapidly. This is why the host may experience multiple bed bug bites in a relatively small area. Once the preferred spot has been located the bug will feed for 5-10 minutes before returning to its hiding spot. In all stages of life they will swell and elongate as they feed. When given the option they will feed every 3-7 days. The rest of their life is spent hiding in cracks and crevices, once a population is established they often congregate in the harborage area. All Cimicid bugs, including the common bed bug, mate by traumatic insemination. After feeding the adult male becomes very interested in mating. He literally grabs on to the female and stabs his needle-like reproductive organ thru the abdomen wall into a specialized organ (Organ of Berlese) located on her right side. The sperm then migrates to her ovaries and fertilizes the eggs. This behavior was thought to cause migration of the female to avoid further abuse; recent research has shown that this is not the case. The adult female can lay up to 500 eggs in her life, although the average is probably closer to 100-200. Assuming she has access to a blood meal and adult males, she will lay eggs continuously at a rate of 1-7 per day. The eggs are laid in and around the harborages and are attached to the surface with a sticky substance. They are oval, approximately 1 mm long and translucent. At room temperature they will hatch in 6-9 days. 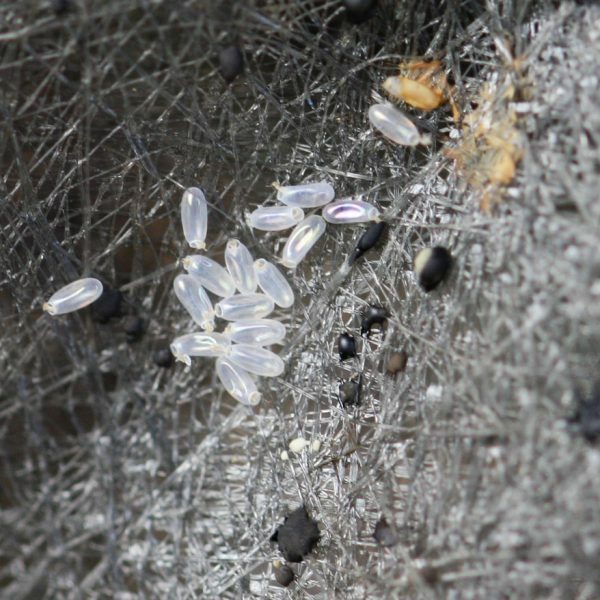 Since bed bugs will happily breed with their siblings a few eggs is all it takes to start an infestation. If you have bed bugs or aren’t sure, we can help you figure it out and give you an estimate of costs.